Der T-34-85 Rudy ist ein sowjetischer premium mittlerer Panzer der Stufe 6. 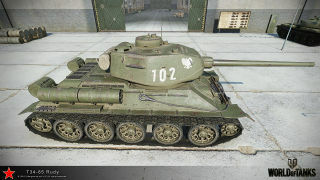 Dieser fiktive T-34-85 mit der Identifikationsnummer 102 der 1. Panzerbrigade der polnischen Armee war in der Fernsehserie „Vier Panzersoldaten und ein Hund“ zu sehen. 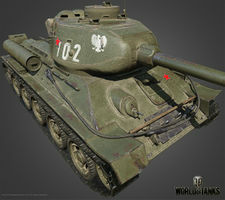 In Wirklichkeit wurden die T-34-85 in Polen Anfang der 1950er in der Fabrik Bumar Labedy in Gleiwitz gebaut. Die polnische Variante unterschied sich stark von den sowjetischen Panzern der späten Kriegsjahre. 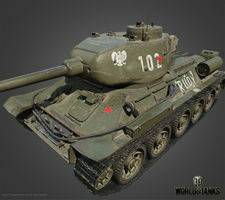 Essentially a buffed version of the regular T-34-85, the "Rudy" has exactly the same playstyle. 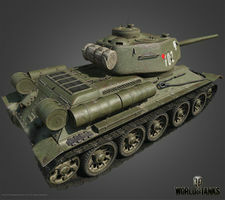 Players who are familiar with the basic tactics for the T-34-85 will find the Rudy much to their liking; more so for experienced players. 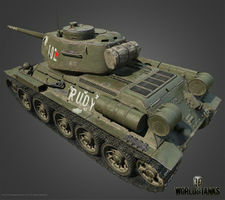 The Rudy moves faster, aims faster, detects farther, and packs more ammo than the regular T-34-85. In most respects what the T-34-85 can do, the Rudy can do slightly better. For all the improvements, there is one downside the player must pay attention to: the engine. With only 145 module HP, a module damaging hit to the engine from a 75mm caliber tank gun is enough to damage it (yellow state) and slow you down. You can mitigate this disadvantage by careful positioning. The transmission like the engine is located in the back, so frontal hits won't damage your engine in the first place. Proceed with care, when exposing sides and rear. 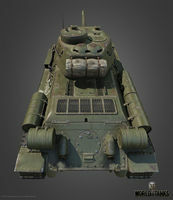 Overall, the Rudy is a solid improvement of the T-34-85 with premium tank status, albeit the noticeably weaker and fragile engine. Actual crew layout is five, of whom the radio operator is currently missing.